As I type this post, it is 39 degrees outside on a Saturday afternoon. It is now 2:10 and it is expected to get even colder as the night falls. The sun has barely shown its face all day, and my house has no central heating, so I am hunkered down in bed under blankets, wearing my fleeciest socks and pajamas. Two minutes ago my cat Tigger was ensconced under my arm, but he has since fled to the kitchen in search of food. I may join him in a second to make some hot chocolate. This drink has been my saving grace all week! I love how it warms me both inside and out. I love how the marshmallows (for what is hot chocolate without marshmallows) float to the top and stick to my lips when I take a sip. Recently I bought some new lipstick from Sephora. I love trying on new shades, seeing how this color brightens my face or how that color makes my mouth look bigger. Makeup can have a very transforming effect on a woman -- I remember seeing a made-for-TV film a couple years ago starring Sarah Chalke (from "Scrubs") in which she played a cancer patient. I can't remember the name of the movie, but I can remember this one scene where she's at her lowest ebb, having lost both her hair and her strength. 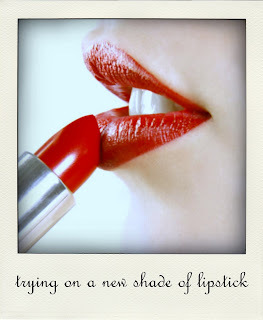 Then she puts on some lipstick, and it's a bright red shade, and instantly both her look and her outlook on life change. I will never forget that. 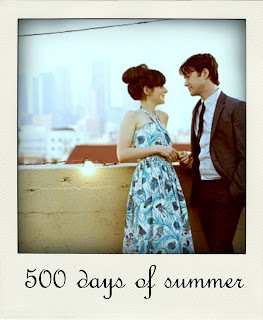 When "500 Days of Summer" came out in the theaters, I knew instantly I would love it. Unfortunately I didn't get around to seeing it until last week, but my original hypothesis was correct -- I fricking lurve this movie. It's difficult to pinpoint exactly what makes me love this movie so much. It's the fact that it tries so hard not to be a love story when all along that it's exactly what it is. It's the music, for I am a huge fan of the Smiths and yes, even of Ringo Starr. It's the clothing, especially Zooey Deschanel's adorable dresses and hair accessories (not to mention those bangs!). It's the witty dialogue, how it feels larger than life and exactly the way I wish I could talk in public, if only I were brave enough. It's the editing, it's the music, it's the acting. It's everything. I tend to gravitate towards quirky singers -- Tori Amos, Fiona Apple, Bjork, Imogen Heap, and P.J. Harvey all spring to mind. I recently discovered a new (well, new to me) singer that just might be quirkier than that entire bunch combined. Her name is Regina Spektor and she is, in a word, wonderful. She's most famous for her album Fidelity, but I think I like her most recent one, Far, even better. It has this really great song, "Folding Chair." In this song you can tell just how much fun she has singing. To her it's not just a talent or a job, it's a fun past time. And the fact that she's so darn good at it just makes it even better. She also happens to be on the most excellent soundtrack for "500 Days of Summer" with my second favorite song of hers, "Hero." So check that out, too, if you get a chance. 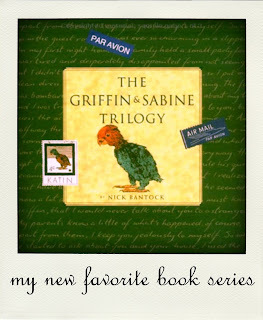 One of my dear friends gave me The Griffin & Sabine Trilogy as a Christmas gift. It may just be the most unique set of books I have ever read. Not for its story -- it is a romance, and goodness knows almost every book that is published has a romance in it in some way, shape, or form -- but for the way the author, Nick Bantock, tells the story. The story is told through postcards and letters, the latter of which are tucked into envelopes that the reader must open in order to read. This style gives you a voyeuristic thrill, as if you were actually reading strangers' correspondence. In addition to the romantic angle, this trilogy has a supernatural undercurrent that manages to feel completely believable. I won't say anything else because I don't want to give key details away. It's a really neat series and I highly recommend it! 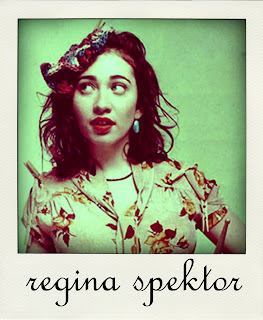 I heart 500 Days of Summer and Regina Spektor! 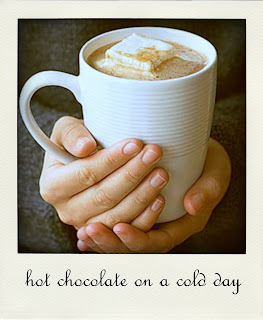 mmmm, hot chocolate. i wish it was cold enough here to snuggle under the blankets and drink some of that loveliness. I feel the same way about makeup. I love how something so simple - concealer under the eyes, or even just mascara - can automatically help me feel better about myself. Oh, and I can totally relate to the shoe thing, too. 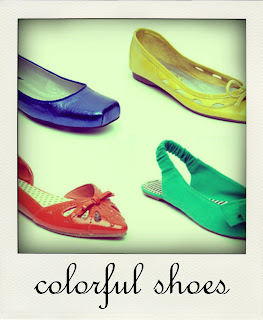 I go for the neutrals, but oh how I would love to have a frivolous, fun-colored pair of shoes. 2. 500 days of summer? awesome movie, and now you've made me want to see it again! 3. regina spektor is my new fave, since friday! And I appreciate the condolences, Brittany. For what it's worth, I think I prefer Blogger over Wordpress. 500 days of summer was fantastic. And I love regina spektor. I also love St. Vincent -- you probably would too. I also love homemade biscuits that I have been making obsessively. I do love St. Vincent! She's amazing. And I love biscuits although it would be a scary sight to see (not to mention eat) if I were to make homemade ones.